"There is no doubt that Automated Planning and Acting will be the text I require my students to read when they first start, and the goto book on my shelf for my own reference. As a timely source of motivation for game-changing research on the integration of planning and acting, it will also help shape the field for the next decade." 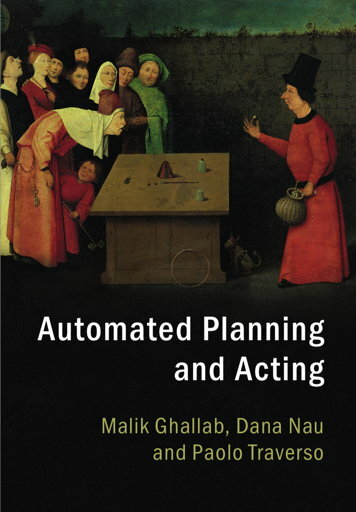 Automated Planning and Acting © Malik Ghallab, Dana Nau and Paolo Traverso. Published by Cambridge University Press, ISBN: 9781107037274, August 2016. PDF of manuscript posted by permission of Cambridge University Press. Users may download a copy for personal use only. Not for distribution. Cover image: The Conjuror, Hieronymus Bosch (c.1450–1516), Musee d'Art et d'Histoire, Saint-Germain-en-Laye, France / Bridgeman Images. Cover designed by Hart McLeod Ltd.